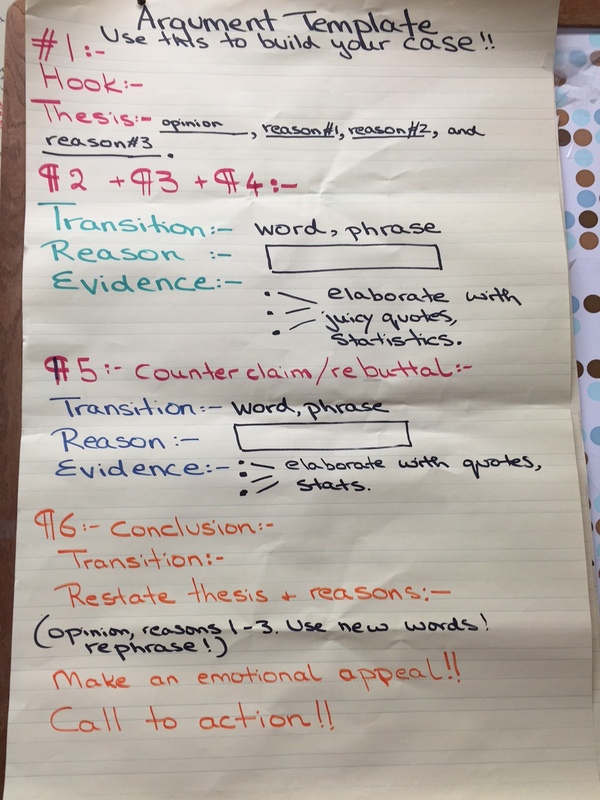 At TC’s Summer Institute a few years ago, Mary Ehrenworth introduced our session to the Argument Protocol: a highly engaging and interactive way in which to gather evidence and formulate strong, well-reasoned claims, which could then lead to compelling persuasive writing. Ever since, the Argument Protocol has been one of the most looked forward to aspects of my sixth grade writing workshop. The moment I begin describing it to my students, I can see their eyes sparkle with anticipation: we get to face off and debate? we get to caucus (they love that serious-sounding word!)? we get to present our case like a real lawyer? 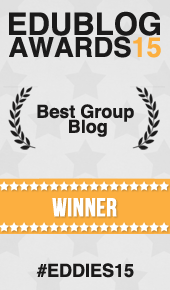 Great – can we start now? We take our time with this, and my kids have the opportunity to ask lots of questions. It’s also important for them to see exactly why each step is necessary for building a strong case, and for them to understand their role in the process. I pick something new each year, and stay away from the type of persuasive writing topics that my kids have been over exposed to in their years of test prep: uniforms, longer school years, etc. 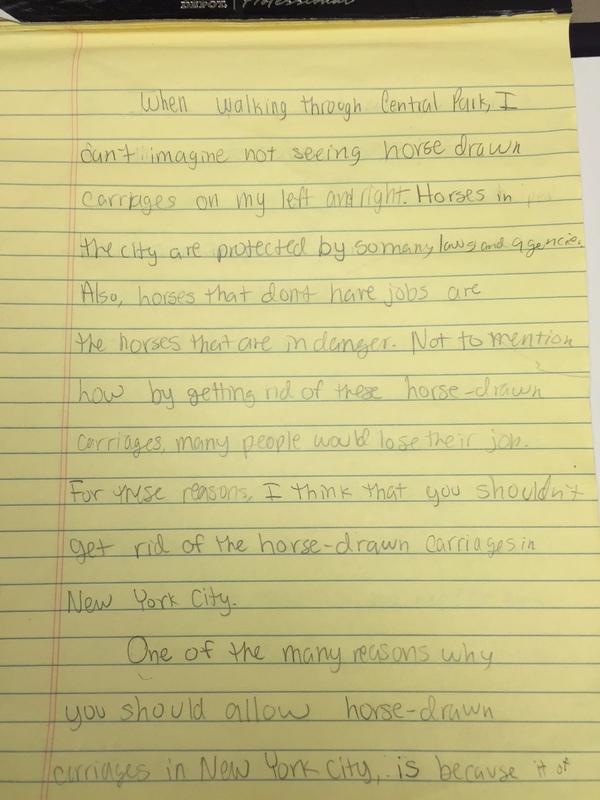 This year I picked a topic I had been interested in myself: New York City Mayor Bill de Blasio’s bid to ban horse-drawn carriages in the city. I have also found that any topic having to do with animals is instantly engaging to kids – they feel invested in the topic, and that it has an authentic importance. I limit the number of articles and sources I present my students, it becomes confusing to sort through too many articles and notes. After all, the point of this whole exercise is to learn the process and language of convincing argument and then to translate that into writing, not collect evidence for a research paper. Students do not know yet which side they will be assigned to debate, so they must listen carefully to all information presented. 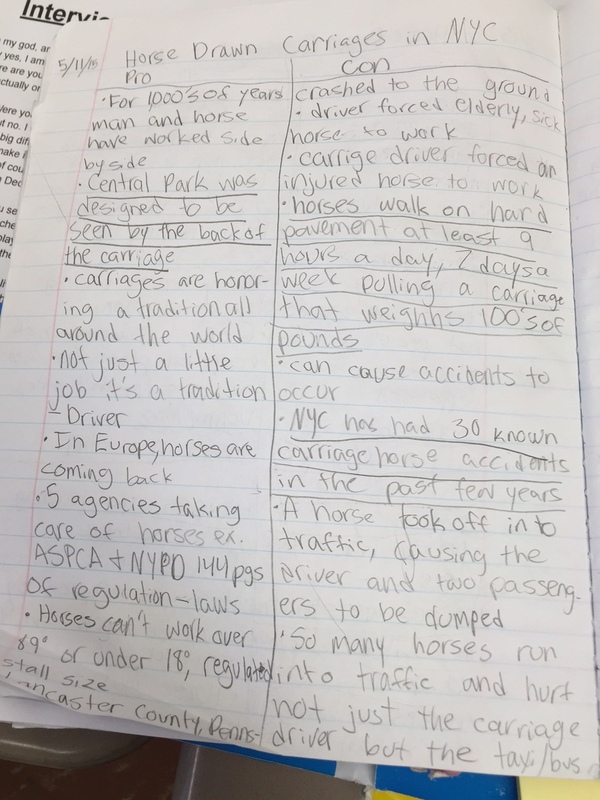 We turn and talk after each source is presented, so that they can clarify or add to their notes. Careful note taking for both sides of the argument. The easiest way is by counting the class and having odd numbers take one side and even numbers take another. Since classroom numbers are rarely even (this is a conspiracy against teachers – I am convinced of this! ), you will have to be part of the mix. But that just adds to the fun. This is where it starts to get loud and messy – the more enthusiastic the students are, the noisier it gets. Students meet on either side of the classroom and present their strongest points, and the job of their teams is to weigh those points and determine if they are worthy enough, fact based enough, and clearly stated through the language of argument. A handout with persuasive words and phrases, or an anchor chart to refer to can be very helpful. 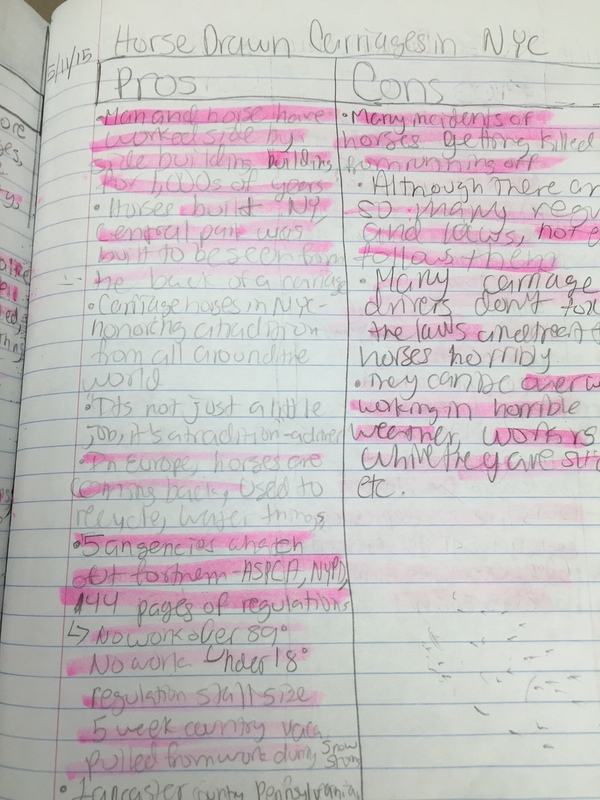 Highlighting the strongest arguments on both sides helps students hone their arguments and sort through their evidence. You will need to facilitate these discussions to keep them from disintegrating into shouting matches (these are kids after all, and they will get carried away!). They will need no more than ten minutes for this – a limit on time keeps them focused and lends an urgency to staying on topic. 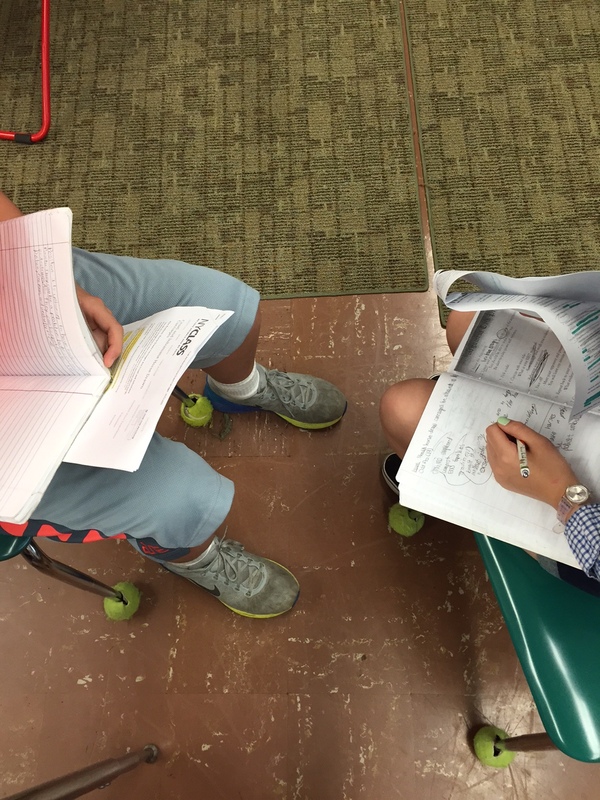 The last three minutes are to write down their stance and two compelling reasons in their writer’s notebooks. I make sure my students do this, so that they don’t forget what they were going to say (a lesson we learned the hard way). The two groups form lines facing each other, partners fan out across the room and present their points. They write down the opposing points of view (so that they can formulate counterclaims), and then they each get a chance to compliment their partner: this was your strongest point, and here’s why I thought so. Each side gets two minutes to present, another minute or so to compliment. 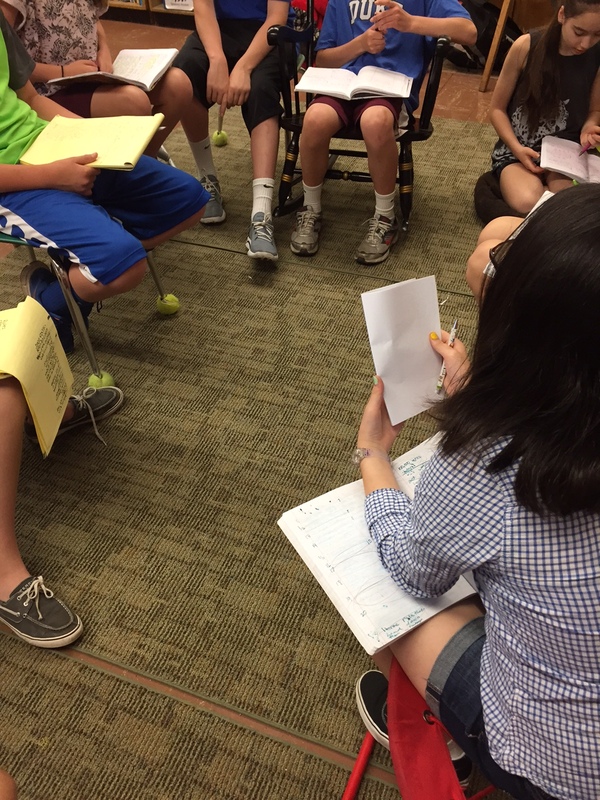 Students share the counterclaims they have gathered and discuss how to best rebut: what evidence can they present? what factual or logical error can they take advantage of? I limit this to about ten minutes, with the last few set aside to write down what they will say. Partners meet again to listen to the counterclaims and take notes. At this point, I loosen the rules and let my kids talk the issue out a bit more. About halfway through, I let them know that they will be choosing the stance they want – the side they wish to argue in their letter to the Mayor. Now that they’ve gathered evidence from both sides of the issue, and heard opposing points of view, they tend to be even more sure of the stance they want to take, and love the idea of choice. 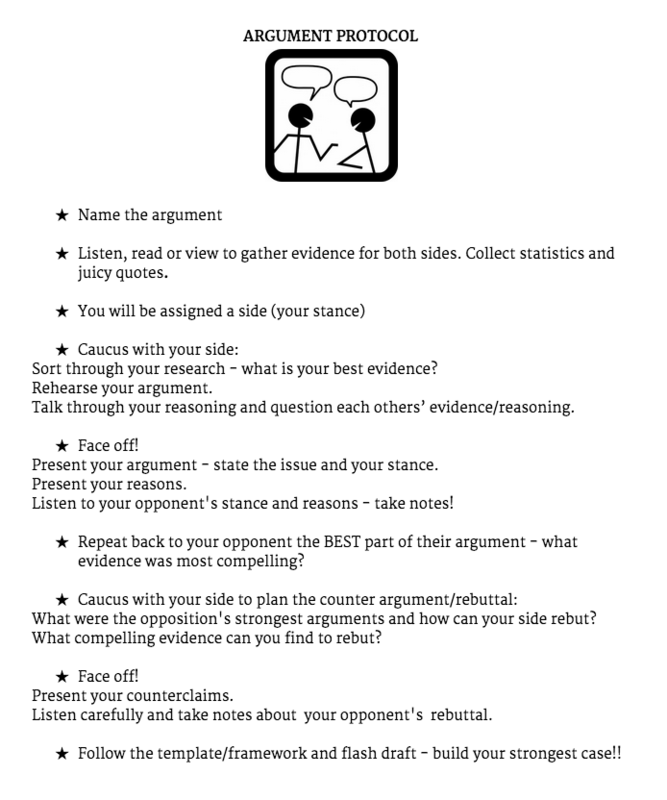 Have you tried the Argument Protocol in your classrooms? What tips or ideas could you suggest to make this process better? Leave a comment and let us know! Love this life lesson: “knowing both sides before choosing a side worked better for me”! Loved this post, Tara. Almost makes me wish I taught sixth grade. …Almost. I love this!!! Thank you for sharing such a detailed and thoughtful way to teach argument!! I’ll have to incorporate this into my teaching next year! I use argument protocol often, and my students love it. Not only is the structure beneficial, the quickness of it ups the importance and excitement level for the students. I have had my 8th graders take notes on post its, which they can then move around to order their argument (or divide up into pro/con sides). Dang. I just started an argument unit. Now I have something else to consider adding to the mix. Thanks! This is such a great post! I love that you took us step by step in such a clear, explicit way. I’ll definitely be going back to this post again and again! The way you are formatting this piece together is friendly for intermediate grades to follow too! Thank you! One of the things I love about your lessons is how thoroughly you plan and carry them out. Your students benefit from your organization and forethought. WE may be able to use this next year with our 6th grade gifted enrichment project. Having a protocol to follow is important and frees the students to dig deep and think freely about the subject.